If you own a generator, car or lawnmower, I am pretty sure you understand how transferring fuel to this equipment can get messy sometimes. This is even worse if you are filling an equipment with a small opening. Fortunately, manufacturers are always ahead of consumers in product development. For instance, most fuel users didn’t struggle with manual syphons for long before fuel transfer tanks were invented. These tanks make transferring of fuel from one tank to another a breeze. Moreover, you can use them to top up lawnmowers, motorbikes, and other smaller equipment. Just to give you a very useful health tip, inhaling gasoline vapours can be very harmful owing to the high number of carcinogenic hydrocarbons. Do not, therefore, take it for granted when you expose yourself to gasoline vapours and other fuel fumes, you need a fuel transfer tank. I know the market is flooded with both counterfeit and genuine products, a condition which makes the selection of high-quality fuel transfer tanks difficult. 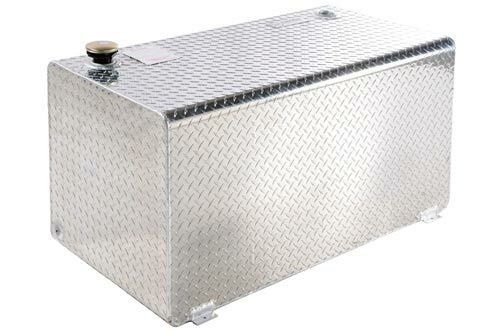 Lucky enough, we have compiled a list of the Best Fuel Transfer Tanks to ease your selection. 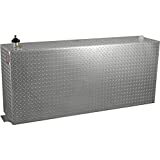 First on the list is the functional Dee Zee transfer tank that is made of the rust-proof 0.125 Brite-tread aluminium. Featuring a radius curve-design, this unit has no space for weld pressure points. Boasting of a whopping 55-gallon capacity, your equipment won’t fall short of fuel. 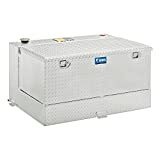 Owing to its superior features such as 3/8” lockable drainage plug, 3 baffles, venting coupler and the lockable cap, this tank is one of the most eco-friendly units you can find in the market today. It completely eliminates any loopholes in leaking fuel fumes. I highly recommend it for safe transport of non-flammable liquids. 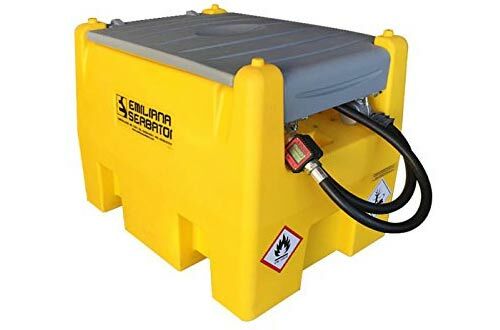 If getting diesel on your hands always disgust you when doing fuel refills and transfers, then you better acquire the Carrytank Fuel Container. Featuring a capacity of 58-gallons, this unit will keep everything full while putting away all the mess. One of the most prominent features of this tank is the 12V DC pump that can transfer fuel at a speed of 10gpm. Carrying this tank is hassle-free owing to its integrated securing ratchet lashing straps and the ergonomic lifting handles. Majority of the fittings are made of aluminium to prevent rusting and corrosion. The automatic fuel nozzle plus the 13ft. antistatic rubber hose makes filling easy, safe and convenient. Other robust features include the air vent device, filling plug and the forklift pockets. Overall, Carrytank makes a great deal for those who own cars, lawnmowers, motorcycles, and other equipment. RDS 71212 is another outstanding piece of equipment that goes beyond ordinary protection. 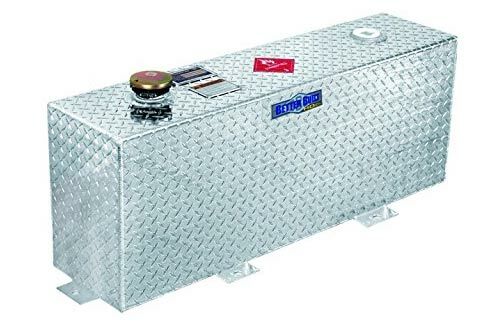 Designed with DOT approved aluminium, this 60-gallon tank is rust-proof and will keep away any contamination. The good news here is, you can use RDS 71212 as an auxiliary tank after purchasing the Diesel Install Kit which is sold separately. 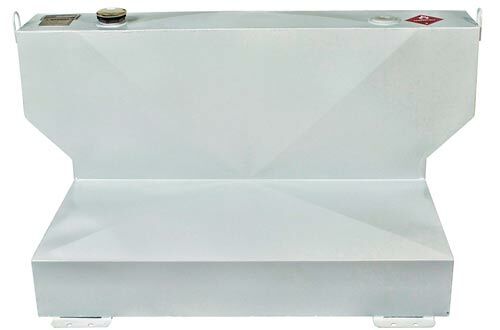 Featuring a vertical design, this transfer tank will fit in the smallest space. You can opt for the 2-inch female pipe thread or acquire a separately sold 12V transfer pump. Worth mentioning is the built-in baffles that prevent sloshing. Overall, the RDS is an amazing piece of equipment worth your energy and time. 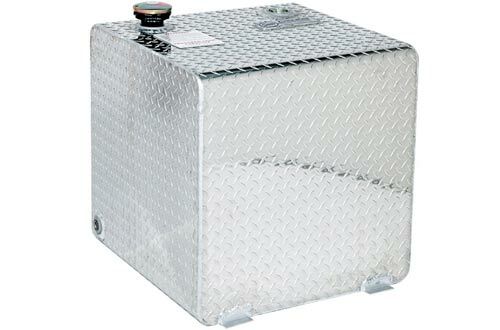 Dee Zee DZ91752 is a non-commercial transfer tank that can conveniently transport non-flammable liquids. However, note that this tank can neither be used with gasoline nor serve as an auxiliary transfer tank. Heavy-gauge Brite-tread aluminium construction enhances durability and long-term sustainability. The Radius-Curving design eliminates weld pressure points. Prominent features that prevent fumes and leaks are the 3/8” drainage plug, 3 stability baffles, and venting coupler. This is the perfect buy for non-flammable liquids and any other private use. Trail FX is another great performer that deserves an honourable space in your truck. It is the ultimate solution for convenient fuel transfer. 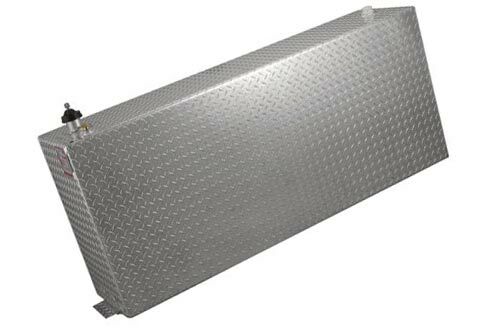 The extra heavy-duty tread aluminium construction withstands all sorts of abuse and elongates the lifespan of this tank. I love the appealing design of Trail FX that fits any space. 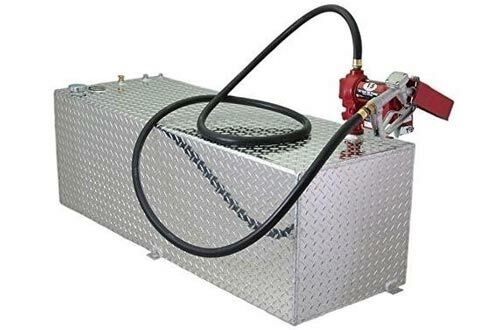 Machined with a capacity of 35 gallons, this unit delivers basic fuel transfer needs. Robust features that make this tank customizable include the venting coupler, recessed drain plug, and the lockable cap. Overall, Trail FX is an outstanding piece of equipment. This model is suitable for high-capacity use owing to its 110-gallon volume. Just like other Dee Zee models, DZ 91753 is machined using high-end Brite-Tread aluminium, making it durable and sturdy. 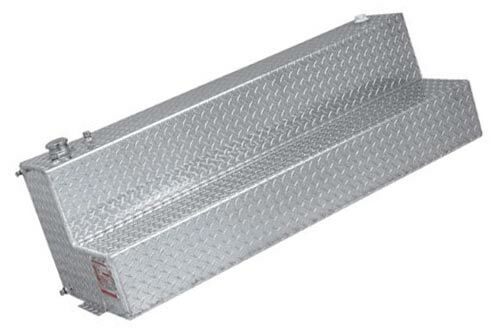 When setting out for the long summer trip, utilize the mounting taps to secure this tank to your truck bed. Curves eliminate weld pressure zones. The setup is easy to understand and install, even the novice find is hassle-free. Measuring L: 48″ x W: 24″ x H: 24″, DZ91753 has an adequate 110 gallon capacity. However, kindly note that this unit cannot be used as an auxiliary transfer tank. Do not also use it with gasoline, it is suitable for transporting non-flammable liquids. The RDS Vertical 73200 is a high-end model that goes beyond ordinary fuel transfer. You can use it to transfer diesel remotely or from a truck bed to other heavy equipment. It is unbelievable how this tank achieves 90-gallon capacity with its super-slim design. It will only take 1-inch of your bed space. 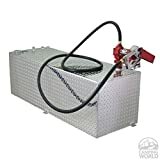 Once you purchase the optional Diesel Install Kit, you can use this unit as an auxiliary tank. The most outstanding feature is, RDS 73200 undergoes thorough pressure and leak tests. 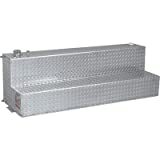 Extra heavy-duty .125 gauge aluminium construction makes this tank durable and safe for fuel transport. To sum it up, this model is the perfect fit for those that often handle non-inflammable liquids. If you desire a convenient way of transferring fuel, Better-Built 29221497 is an ideal choice. It is built to transport safety standards. Featuring an appealing T-design, this tank prevents overfill spills with the automatic shutoff system. Built-in baffles prevent fuel from shifting. Fully welded mountings make the installation of this unit a breeze. Heavy-duty steel construction plus the powder-coat finish enhances durability and prevents rust. Additionally, a 2-inch diameter outlet and inlet are included to increase fuel handling efficiency. 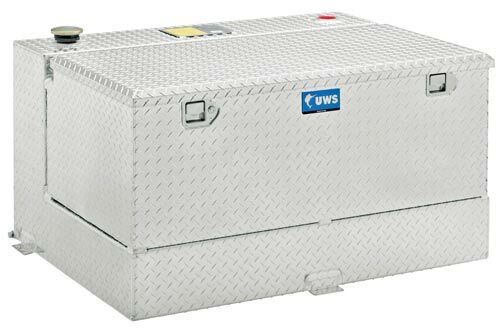 Hands down, the UWS is a commercial-grade transfer tank loaded with several robust features. Heavy-duty aluminium construction plus the patented foam core sandwiched between the aluminium plates delivers unmatched strength. Most incredible is the built-in truck tool box that neatly organizes all your equipment. High-quality ventilation cap keeps the tank content in a good state. 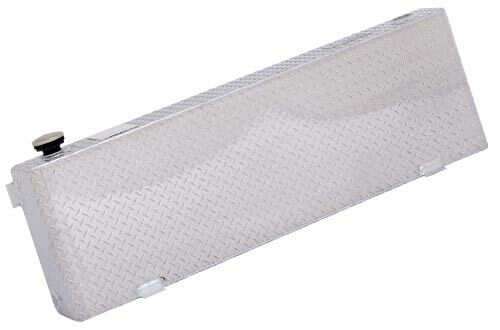 Mounting flanges are integrated to add strength to the truck bed. I find the corrosion-resistant & lightweight construction of this unit quite impressive. UWS transfer tank uniquely strikes a balance between weight and strength. Very few models out there can withstand warping and bends the way this model does, thanks to its excellent construction. As if that is not enough, UWS boasts of an incredible locking mechanism. Remember, this unit cannot be used as an auxiliary tank. 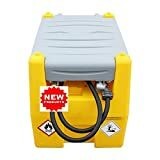 Nevertheless, it provides an excellent solution for convenient and safe transportation of chemicals and other non-flammable liquids. It is a versatile remote petrol station that will meet all your needs. Designed to transfer non-flammable liquids, Model# 70307 is another outstanding product from RDS. 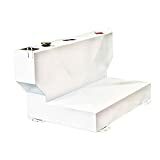 Measuring 55in.L x 18.5in.W x 17.5in in size, this L-shaped auxiliary/transfer tank fits nicely under most beds. The smooth diamond finish and the appealing design can’t be hidden. It has a 2-inch female thread coupling for efficient fuel transfer. Alternatively, you can purchase a separately sold 12V transfer pump. You can also acquire additional Diesel Install Kits. The 48 gallons RDS includes mounting tabs and a rollover valve. Overall, the L-Shaped Auxiliary Transfer Tank is a great product for the price. Do not use it to transfer diesel to another car, neither should you use it with gasoline.